The Mocha Cookie Crumble Frappuccino is a summertime offering from Starbucks that is a favorite with chocolate-loving customers. It’s mocha with a hint of cookies n’ cream – and that is a great combination in just about any form that it comes in. A regular frappuccino might be good when you want to indulge on the go, but it is pretty easy to whip up an at-home version that can hold its own when it comes to flavor. My Homemade Mocha Cookie Crumble Frappuccino is made with equal parts strong coffee and milk, cocoa powder, sugar and crushed chocolate wafer cookies. Oreos work just as well as plain chocolate wafer cookies, so use those if you have some on hand instead of hunting through the market to find the plain wafers. I prefer to use cocoa powder and sugar, but if you have some chocolate sauce that will also work well. All of the ingredients are blended until smooth then, like the drink that inspired it, it is topped with whipped cream and cookie crumbles. The Starbucks version of this frappuccino is topped of with chocolate whipped cream. You can easily make a quick chocolate whipped cream by folding some chocolate sauce into some whipped cream. I happen to like vanilla whipped cream as a contrast to the mocha frappuccino and the chocolaty crumbles on top, so that is what I went with here. 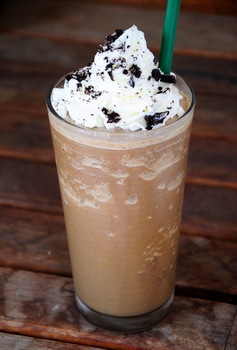 In a blender, combine coffee, milk, cocoa powder, sugar, chocolate wafer cookies (or Oreos) and ice. Add slightly more ice for a thicker drink. Blend at low speed until ice is crushed, then turn up blender speed to high until drink is smooth and creamy, about 30-40 seconds. Serve immediately, topped with whipped cream and crushed chocolate wafer cookies. Recipe can be doubled to serve more.